When metallic dimensions are reduced to the nanoscale, a phenomenon termed localized surface-plasmon resonance (LSPR) appears due to electron oscillations, resulting in distinct optical properties suited for advanced imaging and sensing technologies. As particles approach the quantum regime with dimensions less than 10 nm in diameter, however, the existing knowledge of their properties becomes quite hazy. The plasmonic character depends on the collective electronic excitation that can be tuned across a large spectral range by adjusting the material's size and shape. Size dependent spectral shifts of the LSPR in small metal nanoparticles are induced by quantum effects, but the existing literature on the subject is quite controversial due to inconsistencies. In a new study, Alfredo Campos and colleagues similarly report complementary experiments on size-selected small silver nanoparticles embedded in silica that yield inconsistent results on the same system. The quantitative interpretation offered by Campos et al. in the study was based on a mixed classical/quantum model that resolved apparent contradictions in the experimental data and in the literature. 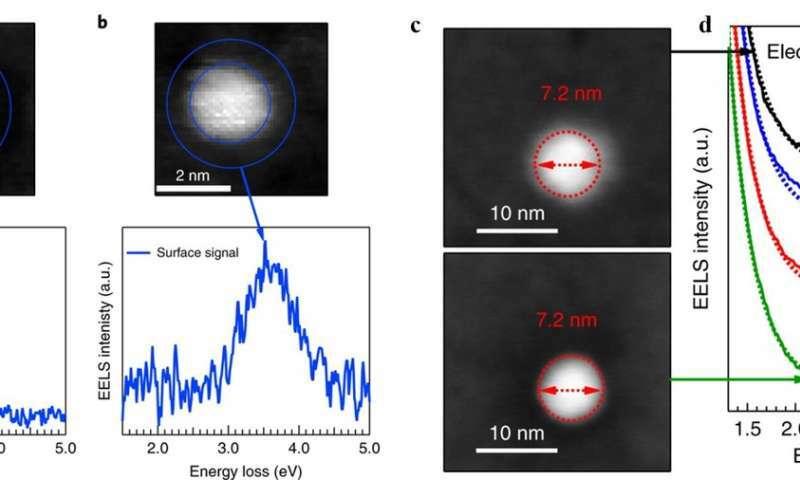 In the experiments, the scientists used optical and electron spectroscopy to investigate plasmonic properties of individual silver nanoparticles with dimensions reaching the quantum regime. The comprehensive model described the local environment as a crucial parameter that controlled the manifestation or the absence of quantum size effects. The results are now published in Nature Physics. Understanding the electronic structure and optical properties of metal nanoparticles is an extremely fruitful playground to develop quantum theories for metal nanostructures. Such systems have applications in catalysis, imaging and biosensing as well as in quantum optics for quantum information transfer. Improved single-particle experimental techniques have recently revitalized the interest in size-dependent plasmonic resonances in nanoparticles (NPs). For instance, electron energy loss spectroscopy in a scanning transmission electron microscope (STEM-EELS) is a particularly powerful technique that allows the mapping of spatial and spectral variations of different plasmon types at sub-nanometer resolution, where quantum effects can make the optical response more complex even for the simplest geometry. The technique can allow direct correlation between a particle's geometry and its plasmon resonance. Previous studies showed a strong blue shift of the LSPR for silver nanoparticles fabricated with decreasing size using wet-chemical methods, in which the quantum plasmonic resonances were interpreted via semiclassical methods. Such interpretations remain controversial since the fundamental aspects of electronic spill-out (leading to a red shift) or influence of the surrounding matrix substrate were not considered. The similarity between electronic and optical observations were also only assumed but never derived for such small particles. As a result, the existing literature for small metal particles and their size-dependent plasmonic properties show large discrepancies that require clarification. The authors first defined open questions linked to interpretations of the size-dependent shift of LSPR in small silver NPs. Then they used new, complementary experimental data to discuss experimental considerations in the study and proposed an interpretation using a quantitative theory. On this basis, they briefly addressed existing contradictions in the literature and focused on localized surface plasmons and not on the likewise observable - volume plasmons. In the study, the authors used a theory of a sophisticated electronic model in a dielectric environment to explain the trade-off that led to a red shift and a blue shift to establish a unifying approach for the optical and electronic properties of the unique system. To overcome physical challenges that were previously observed with a chemically stabilized substrate and matrix effect, Campos et al. used physically prepared and size-selected pure silver particles and embedded them in a homogenous silica matrix. As a unifying approach, the researchers compared single-particle STEM-EELS measurements to ensemble-averaged optical microscopy experiments of the same system. In the study, experimental samples used for optical spectroscopy were approximately 1 µm in thickness, differing from samples used for electronic spectroscopy, approximating 30 nm in thickness. Aside from the size variation, the scientists conducted single particle STEM-EELS experiments across a large range of thin samples fabricated under identical conditions as those used for optical spectroscopy. 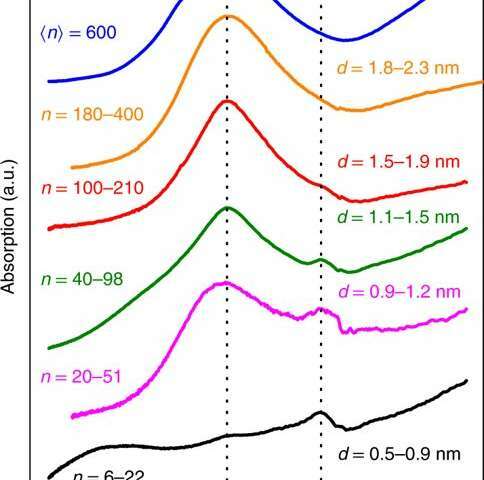 In the STEM-EELS experiments, images of silver NPs of 6.5 and 2.0 nm diameter were viewed alongside their corresponding EEL spectra for clearly visible strong dipolar surface-plasmon peaks at the particle surface combined with blue shifts between the spectra. Closer inspection of the data revealed greater complexity as the majority of NPs did not exhibit LSPR at the start of each experiment, as they were instead surrounded by a diffuse layer of silver oxide. The diffuse layer disappeared with knock-on collisions during continuous electron irradiation, leading to the observed LSPR peak and blue shifts. Under continuous energetic electron irradiation with increasing electron dose, lighter atoms were preferably displaced from the matrix and from additional oxygen at the particle interface. 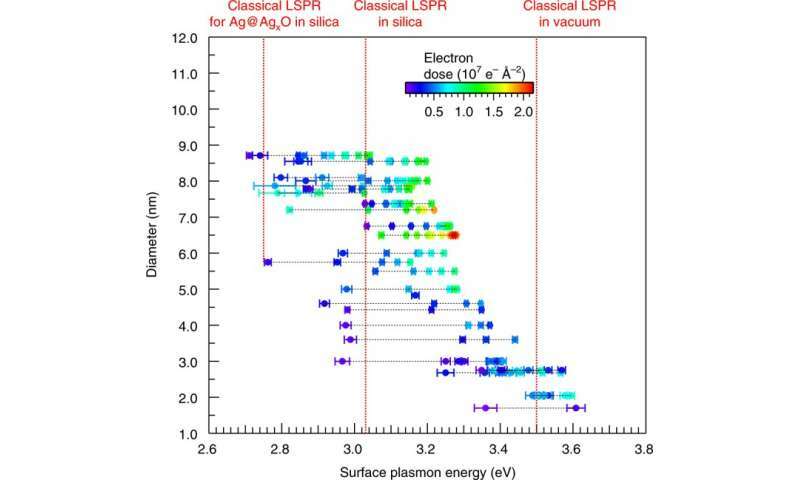 More and more matrix atoms were removed at higher electron doses under the beam leading to increased local porosity in the matrix and at the interface, observed as a trend with time in the study. Values of the dose-dependent peak positions were obtained as a function of size, the LSPR data ranged between 3 eV to 3.6 eV. The results also showed consistent red shifts due to the homogenous high-index silica environment, in agreement with previous results. The evolution of the size-dependent spectral position of the LSPR thus appeared contradictory for optical and electronic spectroscopy in the study. Campos et al. resolved the apparent contradiction between optical and electronic spectroscopy to offer a comprehensive classical/quantum model framework that also clarified existing literature. The observed contradictions in the literature and in the study were not due to different experimental methods but due to different particle environments. The scientists introduced a self-consistent model to resolve existing theoretical and experimental contradictions in the study by accounting for all the important contributions in the system. These included 1) the electronic spill-out, i.e. extension of electronic density beyond particle radius in a non-infinite potential well, 2) the silver surface layer of silver nanoparticles with reduced polarizability, 3) the surrounding dielectric matrix including possible local porosity and 4) relevant finite-size quantum effects including non-locality of the electronic response. The scientists showed that the spectral position of the LSPR (red and blue shift) resulted from a delicate balance between two counteracting quantum size effects (electronic spill-out and layer reduced polarizability). They observed that embedding the NPs in silica red shifted the LSPR due to the increased refractive index of the surrounding medium. The absence of any localized chemical covalent bonds between the metal and matrix were also noted, allowing the phases to retain their intrinsic properties without interference. The scientists formed a theoretical description which correctly reproduced optical experiments that included the matrix-induced effects. They found that the different sample thickness used for optical and electronic experiments that was expected to be a minor variation dominated the spectral response instead, changing the level of protection against oxidation and responses to irradiation - leading to the observed experimental discrepancies. 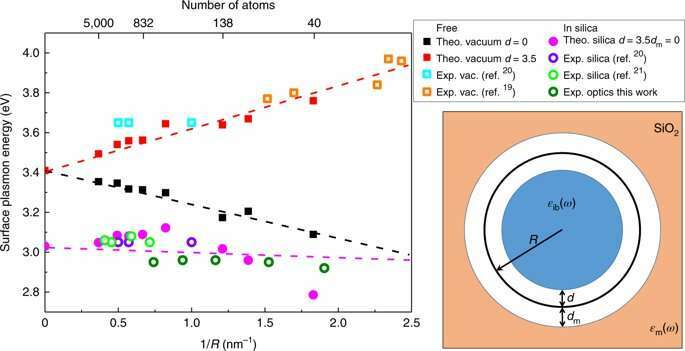 The experimental trends were reproduced in calculations to provide a theoretical model that could quantitatively and consistently interpret the plasmonic response of free and embedded silver NPs. Using the theoretical model, Campos et al. were also able to explain the size-dependent spectral shifts observed in several previous experiments of embedded silver NPs as well, to resolve apparent contradictions in the literature. The scientists emphasized the importance of implementing all relevant contributions of quantum-plasmonic systems as detailed in the study, paving the way for further studies of different plasmonic effects such as volume plasmons and in different systems such as nanoalloys.